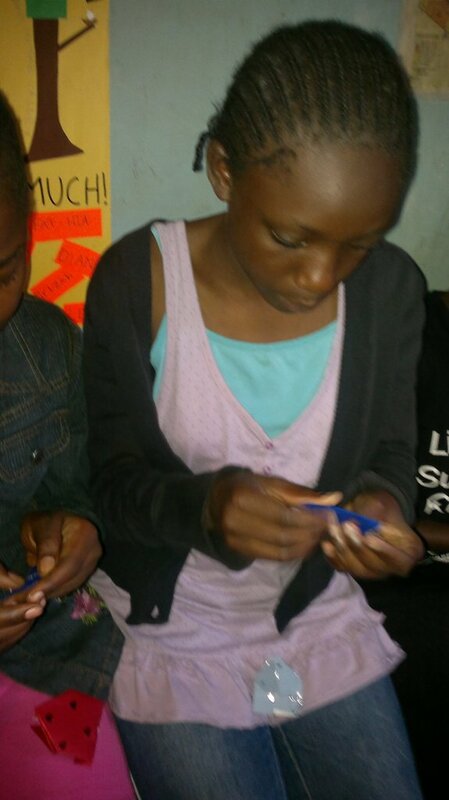 This past Sunday afternoon the Kibera Girls LitClub welcomed special guests. Adam and his wife Alisa of The CookBook Project visited Kibera last month to teach the girls about healthy nutrition and healthy eating. This time, Adam was joined by his lovely sister Ariel, a teacher, and Mother Rita, who was an art teacher for 30 years. They came on this afternoon to share their different talents with the girls. As always, the afternoon started off with introductions. The girls were very welcoming as they told their new friends their names. Thereafter, the girls went to classes where they got to know Ariel a little better. They taught her the "halo song" which she loved, and thought the girls sang beautifully. Then Ariel taught the girls how to make really awesome origami (the traditional Japanese art of paper folding). They folded frogs that could actually hop! The girls really had fun with this activity. After we let our frogs jump around for a while, it was time for our read aloud! This week we chose J. M. Barrie’s Peter Pan, the story of a mischievous young boy who never grows up. He also has the ability to fly, and spends his time chasing adventures with his friends. The girls were fascinated, because they too love adventure. We finished the day with a praise circle, and our favorite song “Kamares.” Everyone was dancing with joy.